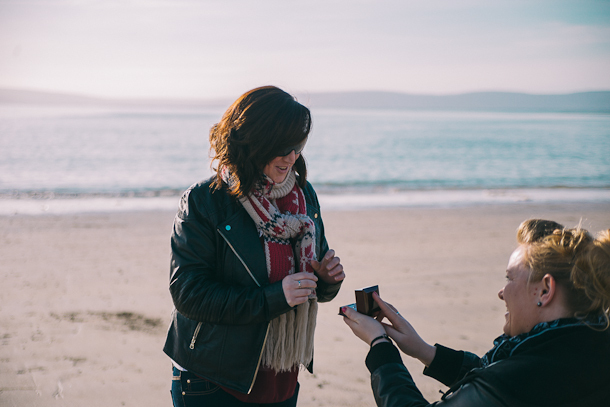 Over the weekend, I had the honour to witness and photograph Helen’s surprise proposal to Alva on the beach in Blackrock, Salthill, Galway. When Helen got in touch with me saying she’d like to surprise her girlfriend on their anniversary with a proposal and wanted me to take photos, I was of course jumping up and down with joy! 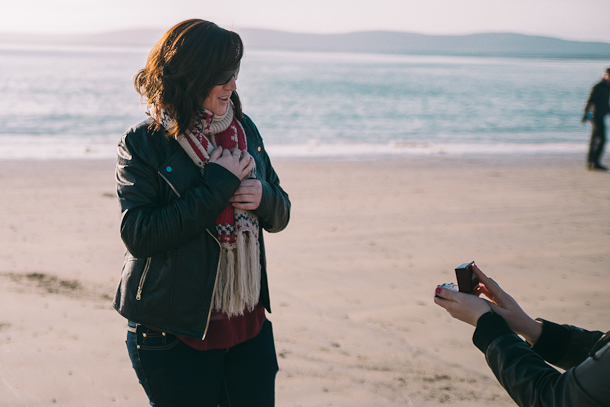 I’ve never photographed a proposal before and I knew I was in for something special. I was still overwhelmed by the huge spectrum of raw emotion that unfolds in front of you in such a short space of time! The day was incredibly sunny, warm and beautiful, the tide was out, conditions were perfect. Over the previous two days, Helen and I plotted and planned a way for me to be able to catch the moment without seeming like a photographer who was just hanging around, which might arouse suspicions in Alva! So, on Sunday at noon, I was just casually strolling along the beach, pretending to be unaware of anything, taking photos of the scenery as people tend to do. Not too far away from me, Helen and Alva were walking along, and then Helen called to me, asking if I could take a photo for them on her phone, nothing abnormal here Alva was thinking! I, of course happily agreed to take the photo, but as I did, my hand was actually trembling as I held the phone, so I can’t imagine the emotions going through Helen’s mind! I handed the phone back and then as casually as possible, while actually inside I was ready to explode, I suggested taking a photo of them on my DSLR camera, which was was Helen’s queue to get down on one knee! It worked perfectly and Alva had no idea up until the very last second what was happening and she had no suspicions at all! As I took the photos, the love between them was almost tangible and I was so excited to have been so privileged to be able to share and document their amazing moment together. 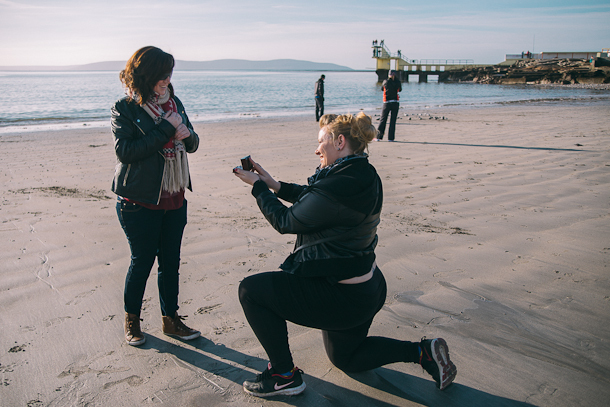 Hopefully in the upcoming referendum in Ireland, we can finally make it legal for two beautiful souls like Helen and Alva to also have the right to get married.